Delete and move files in a Git repository. This renames MyFile01.txt to MyFile02.txt. The point being that you don't have to start a new repository if you want to change the way you have set up your directories. Just use git mv or git rm to delete files. In the following explanation I focus on permanently removing a folder called node_modules from your repository. However, this explanation applies to removing any folder or repository. NOTE: There are two ways to permanently remove files or folders. Below you can find a discussion of how to do the delete using a tool called BFG. What if you did not include node_modules in your .gitignore file? As a result of your mistake, your repository has a lot of deeply nested files in the directory called Week02-GetNumbers/node_modules. Your repository is many times bigger than it needs to be. You should immediately update your .gitignore file in the root of your repository so that it includes node_modules. The next step is to permanently remove the node_modules folders. This is an odd thing to do, because the whole purpose of Git is to keep track, for all time, of all changes that you make to a project. So even if you delete a file from a repository with git rm file_name or git rm -r node_modules, it should still be in the repository, but not in your working copy of the files. 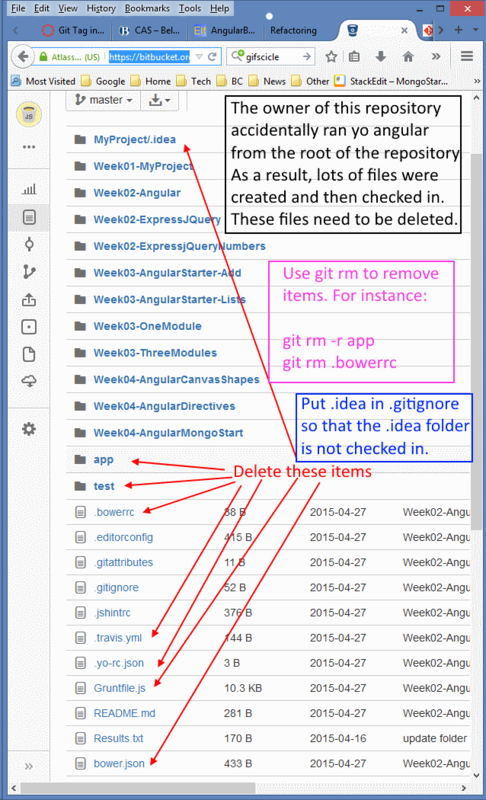 In other words, Git keeps track of the files so that you can recall them if you need them. Use that syntax just the one time. After you have pushed it once, you can resume pushing the repository with a simple git push command. It is difficult to emphasize too often how very important it is to put node_modules in your .gitignore file. Please look on GitHub, Bitbucket or wherever your repository is hosted when you are through with this process and make sure that node_modules is now included in the .gitignore file. There is usually not a lot of difference between git mv and mv. Nevertheless, I suggest you use git mv and git rm when renaming or deleting folders that are already under Git control. Though it is not always a problem, there are cases when using git mv rather than just mv is better able to preserve your history. Every time you commit, Git saves the state of your file. So it remembers what a file looked like the first time you committed it, and each subsequent time. If you use mv instead of git mv, then Git can think that you simply deleted one file and created a new file. Then your history won't be attached to the new file, and you won't be able to see what it looked like in the past. If you use git mv then your history for a file will be preserved. Usually, however, Git can be smart about what happens when you use mv instead of git mv. In other words, it seems to me, and I am not certain about this, that it can usually figure out that a deleted file and a new file are so exactly similar that you must have done a rename, and so it preserves the file history. But I don't think it is good idea to count on this. Instead use git mv to be safe. At first, you won't care much about the history of files since you won't really understand how to go back in time to previous versions. But over time, you will learn how to do this. Then you may find occasions when you are glad you preserved the whole history of a file. But frankly, this topic is complicated, and you should take what I say here with a grain of salt. All I can really assert is just that it is safer and easier to use git mv rather than mv. Notice that the guy says they are the same, but the top comment on his reply is that git mv has a few safeties built in. The discussion goes on from there, but I don't want to try to recap it. It gets pretty technical pretty quickly. git commit -m "Deleting hopeless messed up folder. And, depending on circumstances, sometimes try a git push and git pull after the above to make sure all is still okay. Then: mkdir Week0X-SomeProject or the equivalent, which might be a copy operation or a run of CreateAllExpress etc. The point being that one should work one step at a time. Don't make dozens of changes at once without seeing if you can successfully commit and possibly also push and pull. The same is true in your code, don't make dozens of changes at once without checking to see if your tests still pass and your program runs. If you must make those changes very quickly because you are following along in class and have to move to the next step, then when you are done for the day, comment out nearly all the steps, leaving only the first one visible. Get it to work, then un-comment a bit more of your work, get it set up correctly, etc. Always one step at a time! A tool called BFG can make permanently deleting files from a repository fairly easy. Do this if you accidentally committed something with a password in it, or some huge files or directories (node_modules, .metadata) that you don't want. Now you will have a regular repository and can explore it. Then I choose Alt-Tab to go back to my IDE, and generally it has found my changes already. If not, I focus the Project Manager and press F5 to refresh the view. As I say, this is perhaps less than ideal, but it is my general workflow when in a Git Repository. The point is that Git will track the changes we make that way, so if we need to restore a deleted file, etc., we can do so later on. Just trust Git to keep all your changes.